The Rutland 504 Windcharger is an efficient, reliable and environmentally friendly way of keeping batteries topped up. 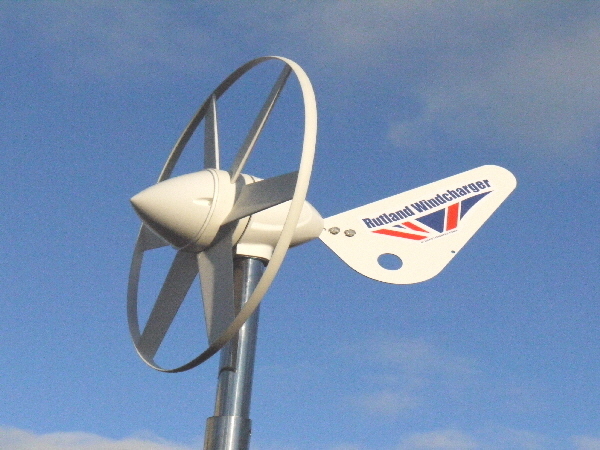 Specifically designed for sailing boats of up to approximately 10m in length the windcharger can also be used for temporary installation on rv's / motorhomes and caravans. Ideal for touring caravanners this kit offers a quick and easy way to temporarily mount the Rutland 504 when parked and get charging the batteries without delay. When on the move the 4m overall high tower is dismantled for convenient stowage. This Marine Mounting kit offers easy installation of the Rutland 504 windchargers on any sailing boat. The kits are supplied pre-drilled for mounting of the windcharger and include all fasteners for assembling the pole and attaching guys or stays. (Guy wires/stays are supplied by the user to suit installation). Low friction, 3-phase, flywheel-effect generator gives smoother more continuous output than smaller size turbines. Robustly designed using marine materials, stainless steel fasteners etc for long product life and made in the UK.